Stone Hoes in order of increasing durability: Sedimentary, Metamorphic, Igneous Intrusive, Igneous Extrusive. Stone Hoes can be crafted with either a stick or a bone as the handle. Knapping out the Hoe Head. Metal Hoes can only be made from tool metals. They can be cast in ceramic molds, or worked on a metal anvil. Bismuth Bronze, Black Bronze, Bronze, and Copper Hoes can be cast using a Vessel or a Ceramic Mold instead of working on an anvil. Place an empty or partially filled Hoe mold into the slot to fill it with metal from the vessel. It takes 100 units of metal to completely fill an empty Ceramic Mold. The text in the vessel's GUI will be updated to show the amount of metal remaining in the vessel. Put the ceramic Hoe mold in the second input slot and wait for the filled mold to finished. 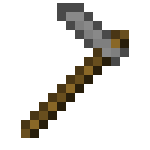 Hoe Heads can also be crafted by using ingots on an anvil with a hammer. This is the only option for higher tier metals that cannot be cast. The durability depends both on the metal used and the skill of the smith forging the tool. Hoes can be used to turn grass or dirt into farmland, as well as check the nutrient and water levels of the farmland, and the harvest state of growing crops. While you can switch to different modes on any hoe, only metal hoes are able to utilize Nutrient mode and show the different nutrient levels of the farmland. The mode of the hoe can be changed by pressing the Cycle Tool Mold key (Default:M), while having the hoe equipped. Standard use, tilling soil into farm-plots, can be used with stone and metal hoes alike. 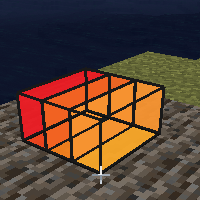 Displays the nutrients available in prepared farmland, colored Red, Orange, and Yellow, for nutrients A, B, and C (colors can be set in config). Nutrient mode is only accessible when the player's Agriculture skill is at least Expert. Highlights the target farmland with black: no water access, and blue: water access. Highlights the farmland with a green display for finished crops and red for those whom are still growing into maturity. colornutrienta Color used by hoes when displaying the levels for nutrient A.
Opacity, where 0 is completely transparent and 255 is completely opaque. Blue component of color. Ranges from 0 to 255. Green component of color. Ranges from 0 to 255. Red component of color. Ranges from 0 to 255.
colornutrientb Color used by hoes when displaying the levels for nutrient B.
colornutrientc Color used by hoes when displaying the levels for nutrient C.
cropfertilizercolor Color used by hoes when displaying the levels for fertilizer. If true then the vanilla Minecraft recipes for creating wooden hoes are enabled. In addition, a recipe is added for converting TFCraft stone hoes to the vanilla version. Hoes can be used to till the new dirt. Stone hoes can be crafted with a bone instead of a stick. Hoes are Large instead of Medium. Hoes have 3 new modes available to help farmers tend their crops. Harvest Mode – This mode will appear green when the crop is ready to harvest and red when it is not yet ready. 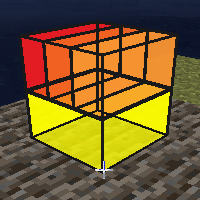 Nutrient Colors when using the hoe can be altered in the TFCOptions config file. The nutrient graph on a freshly tilled grass block. The nutrient graph on a fertilized plot. This page was last modified on 17 November 2014, at 01:35.